This post was made in partnership with Jonathan Louis. As always, all thoughts and opinions are my own. We have lived in this house for two and a half years. I never in a million years thought that nursing at 12 AM in the morning would lead me to this house being posted for sale just minutes before I checked Zillow and that we would be the very first family to look at this house and put in an offer the next day! We were so lucky that the previous owners took our offer over eight others and to have had the honor of living here for the last few years. I am always so amazed by the people who buy a home and seem to have it decorated within a few months. It seems to take us quite a while to get our space the way we envisioned it, but to be perfectly honest, I haven't seemed to mind the slow pace of decorating it. I think a space begins to develop a personality and it takes time to find the right pieces that are not only functional for your family but are also meaningful or to find the pieces that you simply can't live without. I mean, right now we don't even have a coffee table in this room yet somehow this room feels so complete. We have always wanted to create a bohemian zen vibe in this room, which is a mix of our two favorite genres. While Bohemian is characterized by mixing and layering textiles, intricate global patterns and pops of strong, saturated colors, it can come across a little too busy for our taste. The Zen genre tends to be a bit more tonal or monochromatic and features natural materials like wood and sculptural greenery. While the Zen vibe is also beautiful, it is a bit too minimalistic, hence, why we settled on a combination of the two. 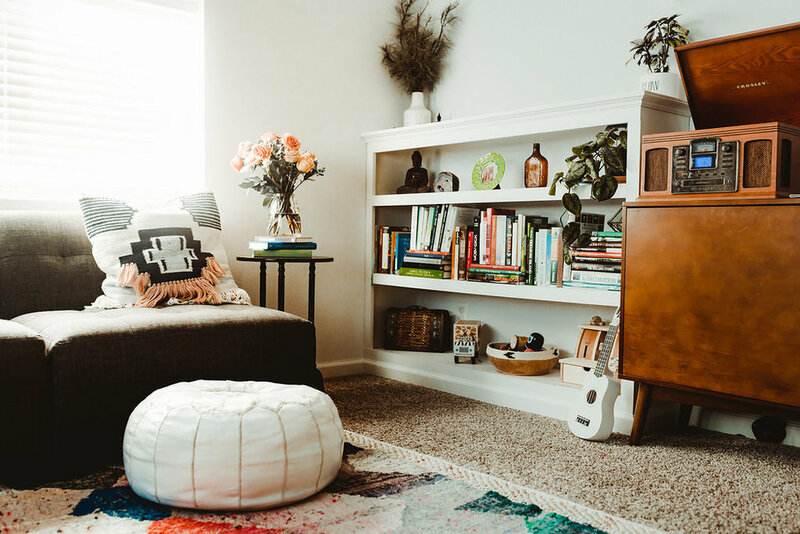 The first post that we did of this room (here) really dives into what we did to decorate with intention along with some decorating tips and tricks. In that post, we talked about how we wanted to extend our couch and this was finally all made possible thanks to Jonathan Louis. When we got married, Perry and I purchased the Belaire modular sectional in a Bennett Charcoal. What spoke to us about this couch was not only its minimal but beautiful mid-modern aesthetic but it's ability to “grow” with an expanding home & family. Our old house was quite a lot smaller so we wanted a couch that we knew we could add onto in the future. To expand our couch, we ordered another Belaire armless chair. I think our soon to be family of four will fit perfectly on this couch now! Jonathan Louis is all about customization and options, with literally hundreds of fabrics/patterns to choose from. So if you like the style of this couch (or anything else you see on their site), they will send three free fabric swatches through their site (here). When we initially thought about ordering this couch, fabric style was a must because of our very hairy Husky! We literally rubbed the swatches on his back to see what fabric was the most "hair resistant" so to speak. Another piece we got from Jonathan Louis is this amazing Mike accent chair in this beautiful Aretha Indigo pattern. We wanted a piece to brighten up the space and we think this statement piece did just that! I am often drawn towards cool colors in furniture like grays and blues and then love to make things pop by adding colorful pillows, rugs, and shelf accessories. I love the blue color of this accent chair and think it makes the room come alive. I have sat on this chair for many hours already envisioning what it will be like to nurse a little one in it soon. I couldn't be more happy with our selections. Some other changes you might notice is that we moved the fig tree from behind the couch to between the couch and accent chair. We wanted to make room for this beautiful moon mirror that we received for Christmas. Another thing we did is add our record player to the room. Winter is very much into dancing and singing so we wanted to accommodate her interests and have music more accessible to her. We spend the most time in this room. It holds so many memories and I cannot wait to create more soon. If you want to check out what else Jonathan Louis has to offer, you can find Jonathan Louis retailers near you by clicking on their website’s “dealer locator” and plugging in your zip code here. In Southern California, you can find them at Mathis Brothers! East coast friend, try Jordan's Furniture or Raymour & Flanigan (which has similar modulars like mine and can do special orders).